Professional real estate investor David Campbell and his team of advisers share ideas on how to become a more profitable cashflow investor in this free video training series. A Real Estate Investor’s Comparison of IRA, ROTH IRA, and 401(k): If you aren’t exactly sure what the difference between IRA, ROTH IRA, and 401(k) this video is for you. Professional investor David Campbell, uDirect IRA president Kaaren Hall, and CPA Amanda Han present an easy to understand comparison of the features and benefits of investing through an IRA, ROTH IRA, or 401(k) with an emphasis on using these qualified plans in a self-directed account. Tax Planning Strategies For Cashflow Real Estate Investors: Learning how to legally avoid or defer the payment of income taxes is essential to your financial success. Our world class faculty will show how real estate investors can legally earn more cashflow while paying less in taxes. You will learn 8 CRITICAL strategies from CPA Amanda Han, real estate attorney Jeff Lerman, estate planning attorney Jeff Lerman, professional investor David Campbell, and self-directed IRA expert Kaaren Hall. 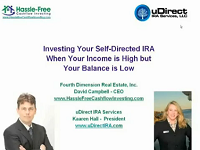 In this FREE video, professional real estate investor David Campbell and Kaaren Hall president of uDirect IRA Services share the philosophy, strategies, and tactics behind using a self-directed IRA to create hassle-free cashflow. 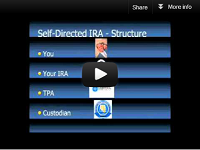 Learn (1) what is a self-directed IRA, solo 401k and why almost every American needs one (2) how easy it is to set up and manage a self-directed IRA to purchase investment real estate (3) how to make sure your self-directed IRA stays tax deferred for as long as you want it to (4) how to use your self-directed IRA to retire younger than you thought possible (5) the pros and cons of owning real estate in a self-directed IRA (6) how to get the best financing for your self-directed IRA (7) the difference between UDFI & UBIT and how to minimize your tax bill (8) which investments should you own personally and which investments are better suited for your IRA. 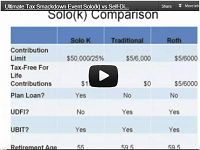 Ultimate Tax Smackdown Event Solo(k) vs Self-Directed IRA: Would you like to maximize your retirement contributions as a Small Business Owner or Real Estate Investor? 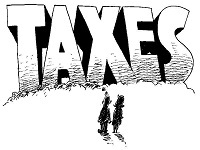 Would you like to create tax free Roth money regardless of your income? 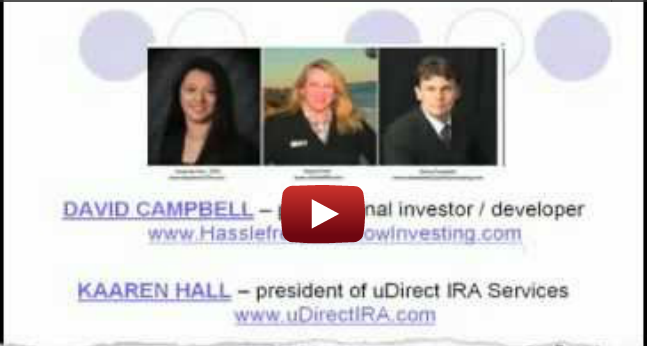 Would you like to invest in leveraged (financed) real estate inside your IRA and AVOID the hidden taxes UBIT and UDFI? Would you like to access your retirement account TAX FREE & PENALTY FREE? This video is for you! Using A Self-Directed IRA When Your Income is High But Your Balance is Low: You’ve been hearing a lot about about self-directed IRA s and real estate. You’re intrigued. You can think of all kinds of real estate investments you’d use your self-directed IRA for. The only catch? You don’t have much money in your IRA yet. So, what do you do while you’re building up a balance inside your IRA? How can you take advantage of today’s amazing real estate market if you don’t have the resources inside your IRA to make a 35-50% down payment or pay all cash for a property? Watch this 60 minute training video and find out! Creating Powerful IRAs for Business Owners & Real Estate Investors In this 60 minute free training video for real estate investors you will: Learn about contribution limits and using loopholes that allow business owners and real estate investors to maximize their retirement contributions; learn the 4 important things real estate investors must consider in choosing the ideal retirement account; learn strategies real estate investors use to pay themselves instead of the IRS; learn to invest in leveraged (financed) real estate inside your IRA and AVOID the hidden taxes UBIT and UDFI? ; learn to create tax free income and retire younger than you thought possible; learn to access your retirement account at any age TAX FREE & PENALTY FREE; learn the difference between traditional IRAs, Roth IRAs and 401(k) plans; learn special tax and investing tips for real estate investors and the self-employed. 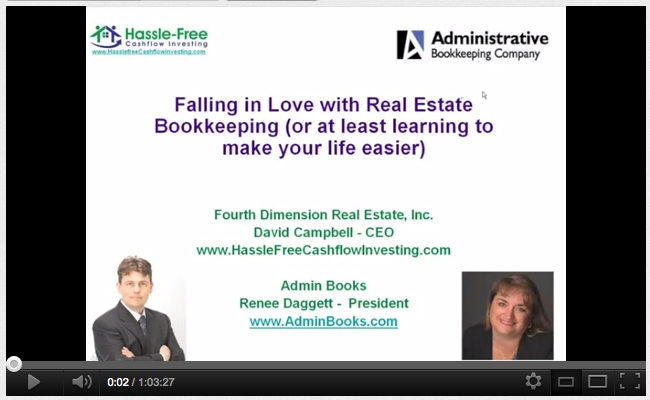 Falling in Love with Real Estate Bookkeeping: While we can’t guarantee you’ll fall madly in love with real estate bookkeeping, we do hope to share some ideas that will make your life easier. * The 3 biggest myths about real estate Tax Deductions – debunked!